University of Chicago's admissions rate has dipped at a much faster rate than peer institutions. Each point in the graph displays the average percent change over an interval of three years. This year, undergraduate acceptance rates have dropped from 8.4 percent to a record low, with only 7.8 percent of applicants admitted to the Class of 2019. The College received 30,162 applications for the incoming class and extended 2,356 offers of admission. 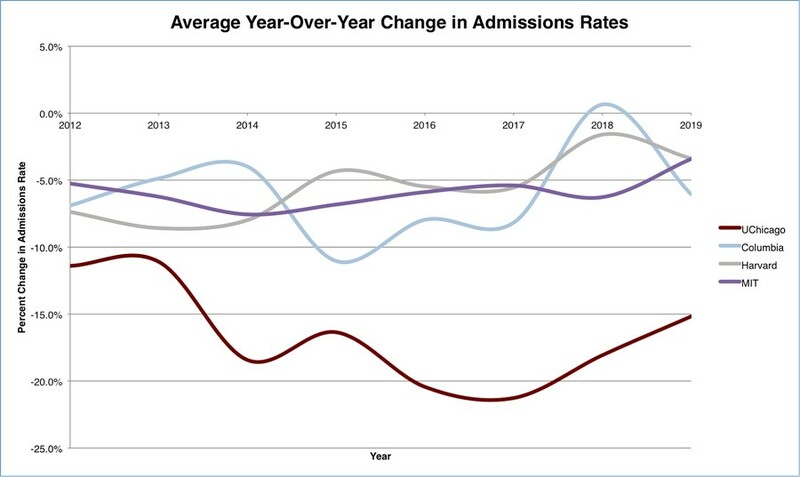 The decline in this year’s acceptance rate continues the trend of increased selectivity in applications to UChicago, as well as many other comparable institutions. The lower acceptance rate marks the 10th consecutive year of a decline in admission rates, beginning with a 40.3% admission rate for the 2005. Application numbers have also jumped from roughly 9,100 applicants for the Class of 2009, marking a 331% increase in the past ten years. The College also saw almost a 10% increase in applications this year, as compared to the previous year with 27,499 applicants. However, the admission cycle for the Class of 2017 still boasts the highest applicant number, with 30,369 applications received through the Early Action and Regular Decision cycles. Acceptance rates to many other colleges also declined in comparison to previous years. Columbia accepted 6.1 percent of applicants, Stanford accepted 5.05 percent, Duke took in 10 percent, Brown extended admission to 8.5 percent, and Dartmouth had a 10.6 percent acceptance rate. Only five peer institutions (Stanford, Harvard, Yale, Princeton, and Columbia in that order) reported lower rates of admission than UChicago. Much of the University’s steep increase in applications is credited to recent changes in the application process. Applicant numbers rose after the University announced earlier in 2014 that it would be utilizing the Universal College Application (UCA), an alternate application system to the Common Application, for the Class of 2019. Technical glitches in the Common Application system around the time of application deadlines earlier last year resulted in a decline in applicants. Similarly, application numbers rose dramatically when the College first adopted the Common Application in 2009 and hired Jim Nondorf as the new dean of undergraduate admissions in 2010, resulting in changes to the College’s marketing strategy. The University cites other major developments as a part of the recent success in attracting applicants, from the new Institute of Molecular Engineering to the Logan Center for the Arts. According to Chicago Magazine, the University “embarked on a $1.5 billion spending spree” in recent years as part of efforts to build the new arts and engineering centers, among other new buildings. Through these various initiatives, the College has secured one of the highest ranks in the U.S. News & World Report Best College Rankings, tying for fourth place with both Columbia and Stanford and surpassed only by Harvard, Princeton, and Yale. A record-breaking 11,403 students applied to the College through the nonbinding Early Action round, making up over a third of this year’s applicants. Students applying during this application round were notified of their decisions in mid-December, while Regular Decision applicants received their decisions in mid-March. Admitted students will have until May 1st to accept enrollment in the College. Many schools release their numbers around this time. UChicago did last year.